Defining what you want, a reason that drove them past their fears and on to success. Defining what you want is the critical first step in almost any situation. You can have anything you really want but you cannot have everything you want. Successful people aren't inspired from birth to achieve goals. They did what they did for a reason. But not just any reason. It was a reason so strong it overpowered any obstacles standing in the way. A reason that drove them past their fears and on to success. With a strong enough reason, the motivation to act will follow naturally. 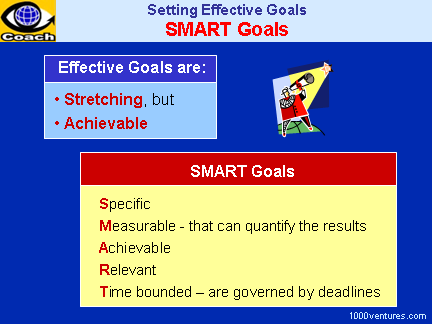 Stretch goals energize and push you to work harder at meeting more difficult targets and to achieve more than if you had set an easier goal.